Vintage chic is the ultimate look for a bedroom. Harking back to the high style and quality of a bygone era, it evokes gentler times and marries comfort with effortless style. The good news is, with a few tweaks and accessories, a vintage boudoir can soon be yours! Why go to the expense of a new bedroom suite, when new drawer knobs can transform a tired chest of drawers and add a splash of colour to cupboard doors? 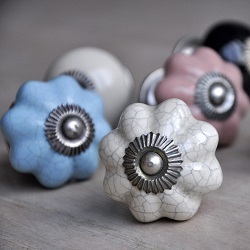 Try the stunning butterfly ceramic drawer knobs - they're sure to bring back memories of hazy summers past. Looking for a more subtle touch? Our crackle glazed drawer knobs give a patina of age that speaks of timeless elegance. 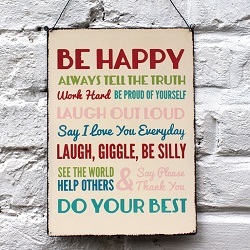 just the sort of message you'll want to sleep on. Don’t worry, we don’t mean wash boards and mangles, just a simple dash of high Victorian colour to brighten your bedroom! We’re talking vintage laundry bags, like our Red Paisley laundry bag - a practical storage bag that really looks the part. Accessorising a children’s bedroom with a few vintage flourishes? Look no further than our Vintage Kids storage bag! 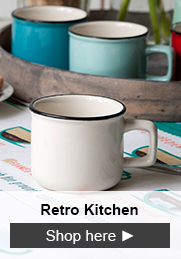 Don't just stop at the bedroom - check out our tips for making a beautiful mid-century kitchen too! 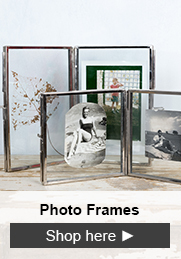 Looking for somewhere to store your knick knacks or jewellery? Accentuate the vintage by choosing this two drawer vintage wood cabinet, just the ticket for small items. For a larger option, look no further than the three drawer vintage wood cabinet. 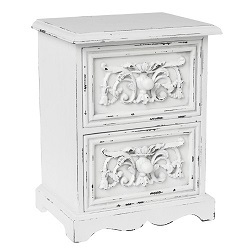 Both come with an antique white finish, and are exquisitely detailed in the style of the Belle Époque.